With its lip-smacking food, bustling street markets, and gleaming modern façades, it’s hard to contest that Seoul is one of the best cities to visit in East Asia. But don’t let this never-ending metropolitan buzz fool you: There’s far more waiting outside Korea’s capital than first meets the eye! Of all the main reasons to stick around for more than a day in Seoul, top of mind should be to take on the city’s surroundings and check out Korean life beyond the big city. The best day trips from Seoul can be shocking—and I mean that in the best way possible. Among them you’ll experience everything from quiet mountain hikes that completely counteract Seoul’s fevered pace to ancient cities hiding cultural treasures in their midst. At Bukhansan National Park, granite peaks pierce through deep forests that change their tune over the seasons. In spring, one of the best times to visit Seoul, bright flowers bloom across the park, creating a silken scene you can’t help but love. The summery greenery, and, even better, the explosion of fall colours tell an equally compelling story about this outdoor escape. Although there’s an endless array of hiking trails in Bukhansan National Park, the most popular for day trippers from Seoul is the Bukhansanseong Course. This relatively easy 3.4-kilometre trail leads to Baegundae Peak, the park’s tallest peak at 836 metres, from the Bukhansanseong Hiking Support Center. 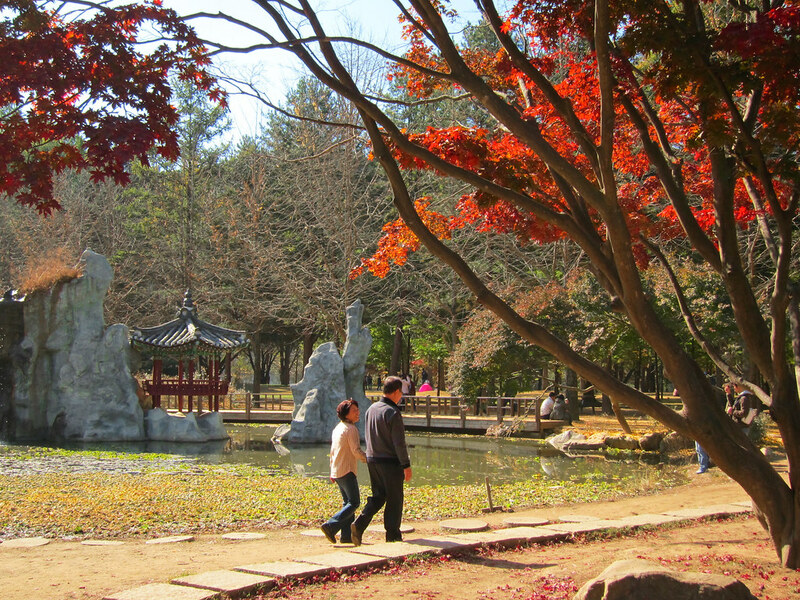 Saunter along it on your day trip, and you’ll soak in some of the best scenery around Seoul, peppered with temples and streams. Mt. Bukhan Hike & Korean Spa Treatment: Combine adventure with some serious pampering on this full-day combo tour. Spend the morning getting some fresh air at Bukhansan before retiring to a Korean spa where you’ll receive a relaxing body scrub at a traditional Korean sauna, oil massage, and facial. Using Seoul public transportation, hop onto Line 3 of the Metro to Gupabal Station. Go to street-level via Exit 1, and look for Bus 704 to Bukhansanseong Fortress (북한산성). Alight at the Bukhansan bus stop. By far one of the easiest side trips from Seoul, Suwon feels at first more like an arm of the Korean capital than a city with its own identity. Of course, that’s not the case. In fact, even if you’re not day-trippin’, there are plenty of things to do in Suwon to keep your schedule full! If you’ve only got one day in Suwon, however, your choices will be fairly obvious. Start off exploring at Suwon Hwaseong, a fortress that reigns back to the late-18th century Joseon Dynasty under the leadership of King Jeongjo. This UNESCO World Heritage site is not just one of the most impressive attractions around Seoul, but a must-see in Korea. Don’t rush exploring the Hwaseong. There’s plenty to see here whether its hiking along the fortress wall from the beautiful Paldalmun Gate to the northerly Hwahongmun Gate for awesome views over the city or ducking into the Hwaseong Fortress Museum for a mini history lesson. 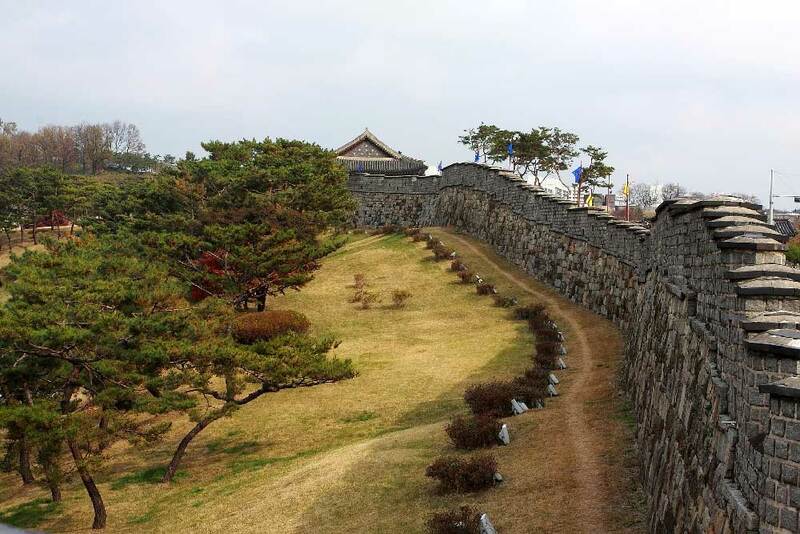 Suwon Hwaseong Fortress Tour: Get the most out of your visit with this complete 4-hour guided tour of the must-see Suwon Hwaseong Fortress and Hwaseong Haenggung Palace. Includes hotel pick-up in Central Seoul & drop-off in Myeongdong. World Cultural Heritage Tour: Combine a morning visit to Seoul’s World Heritage Sites like Bukchon Hanok Village, Jongmyo Shrine, and Changdeokgung Palace with Hwaseong Fortress on this full-day guided tour. All entrance fees and hotel pick-up/drop-off in Seoul are included. Hwaseong Fortress & Korean Folk Village Day Tour: A full-day tour dropping in to both Hwaseong Fortress and the Korean Folk Village, two of the most important sites for understanding the illustrious Joseon Era in Korea. Metro: Take Line 1 from Seoul Station to Suwon. The fare is ₩1,300 and takes about one hour. Korail: From Seoul Station, grab a regular Korail train (₩2,700) to get to Suwon in 36 minutes. KTX: The quickest and most comfortable option for getting to Suwon. Tickets cost ₩8,400 for a reserved seat. The journey is just 25 minutes. Need a little more tension for your Korea trip? (Who doesn’t?) You’ll find it in spades at the Korean Demilitarized Zone (DMZ)! Just north of Seoul, this four-kilometre-wide strip of land cushions the borders of North Korea and South Korea. Without doubt, this is one of the tensest places you’ll ever visit where stoic border guards stare each other down emotionlessly, ready to pounce should hostilities flare up. Of course, the odds are against it at any given moment. Either way, part of the fun (if you’d call it that!) in visiting the DMZ is to let the intense scene envelop you while you tour guide’s scare tactics—like “Don’t point your camera at that watchtower because they’ll think it’s a rifle scope!”—sink in. The DMZ is isn’t one of those typical Korean destinations that you can tackle on your own. With the tenuous nature of its existence, you’ll need to hop on a tour for the full-on DMZ experience. There are plenty of DMZ tours to choose from, but I’d recommend a Korean Demilitarized Zone (DMZ) and JSA Panmunjom Tour. Unlike other tours, this one shuttles you over to a Joint Security Area (JSA) for an up-close-and-personal view of North Korea. The tour even enters into North Korea territory via a border-straddling conference room where nothing but a laster-focused North Korean border guard stands between you and the most reclusive country on earth. Although roaming around the JSA to views of the North Korean countryside is definitely the highlight of the visit, other destinations like the Third Infiltration Tunnel and Dorasan Station, a haunting unused train station with planned rail links between Pyongyang and Seoul, are worth visiting, too. 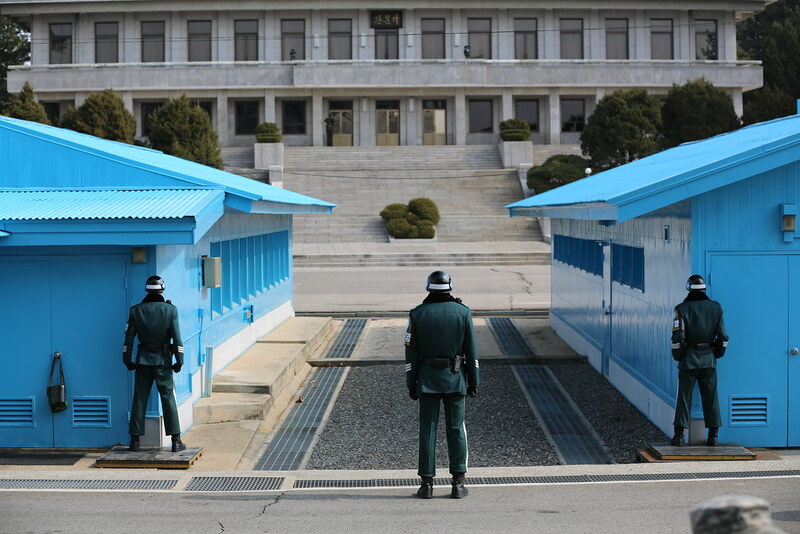 DMZ Zone and Joint Security Area Full-Day Tour: The most complete DMZ tour including a visit to the United Nations-controlled Joint Security Area where you can set foot onto North Korean soil in the joint conference room. Also includes stops at the Unification Bridge, Bridge of No Return, Imjingak Park, DMZ Theater and Exhibition Hall, Third Infiltration Tunnel, Dora Observatory, and Dorasan Station. JSA & DMZ Full Day Tour with North Korean Defector: Another full-day DMZ tour including the JSA. In addition to the major DMZ sites, you’ll get to experience a Q&A session with a North Korean defector who’ll describe life in the DPRK & the tumultuous modern history of the two Koreas. Private DMZ Spy Tour: A super unique & exclusive full-day tour that follows the North Korean Spy Commando Infiltration Maneuver trail into the DMZ. Highlights include Imjingak Peace Park, Dora Observatory, and a North Korean lunch. South Korea Demilitarized Zone Half-Day Tour: A budget-friendly alternative to the full-day DMZ tours. Although it visits The Third Tunnel and Dora Observatory, this tour, unfortunately, does not include a stop in the Joint Security Area, the major highlight of the DMZ. It’s not possible to enter the DMZ independently using public transportation. Of all the tours available, I’d go for the Korean Demilitarized Zone (DMZ) and JSA Panmunjom Tour. The Joint Security isn’t a standard stop on many of the cheaper DMZ tours, and will definitely be the most memorable part of the trip! Most visitors to Korea only know Incheon for one thing: its airport. It’s a crying shame. Truth is, Incheon’s got plenty of magic on its own to recommend it among one of the best Seoul day trips. With Seoul just 36 kilometres away to the east and other more famous destinations lurking elsewhere in Korea, Incheon’s always getting the cold shoulder. It’s even more surprising when you realize that at 3 million inhabitants, Incheon is the third largest city in Korea, lagging behind only Seoul and Busan! Forgetting all these lame geographical facts, there’s plenty of things to do in Incheon to keep you jazzed up on a day trip. 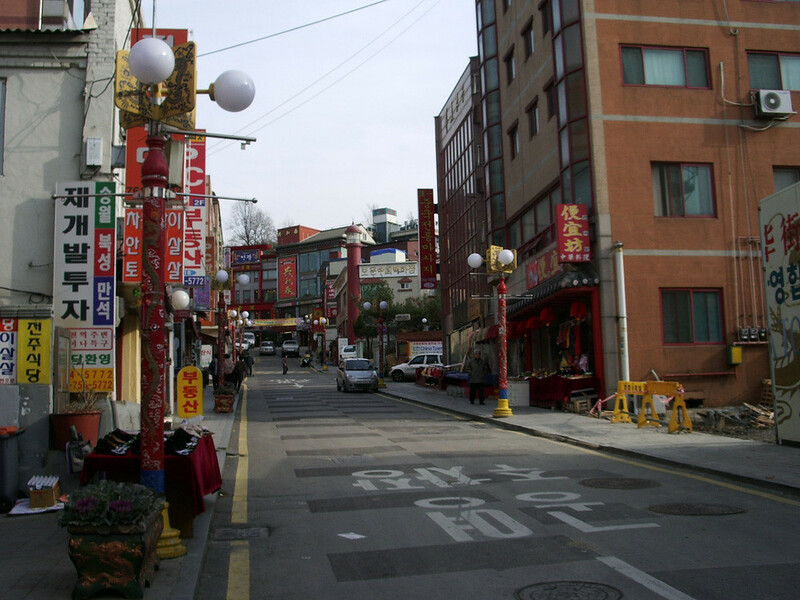 Start exploring Incheon through Chinatown, the most vibrant corner of an otherwise sober city. Located just outside of Incheon Station, Chinatown features eye-popping Chinese-inspired (even if a little-less-than-authentic) architecture and colourful street murals. While you’re there, be sure to taste the district’s famous Korean-Chinese delicacy of jjajangmyeon (noodles with black bean sauce). Elsewhere in Incheon, just northeast of Chinatown, summon your inner kid at the Songwol-dong Fairytale Village. No doubt one of the weirdest redevelopment projects in the history of city planning, this fairytale-inspired area, once a faltering port district, breathes happiness into the lives of families and solo travellers alike. With interconnected subway systems, it’s a cinch to get o Incheon. By metro, you’ll need to take Line 1 to Incheon Station. Exit 1 puts you directly across the street from the Chinatown entrance gate where you can start your journey. Escaping the urban madness of South Korea’s capital is as easy as flipping over to the small town calm of Gapyeong. The area is famous for its Namiseom (Nami Island), one of the top spots for viewing autumn colours in Korea and the filming location for Winter Sonata, a popular Korean drama that’s indeed as sappy as it sounds. Mt. Seorak Hike and Nami Island Korean Beauty Scenery Tour: A full-day excursion starting with a pleasant hike up Mt. 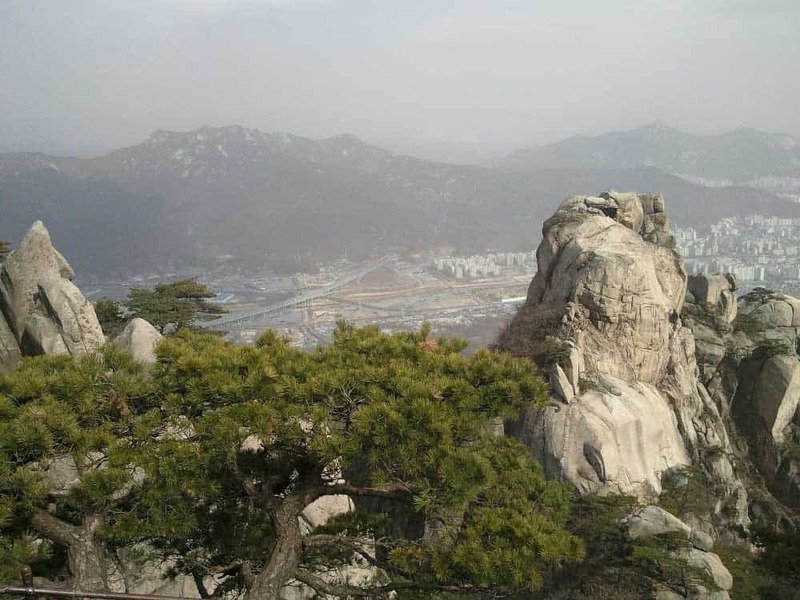 Seorak for incredible views followed by a visit to Nami Island. Full-Day Nami Island and Garden of Morning Calm Tour: A relaxing tour of Nami Island & the Garden of Morning Calm that includes hotel pickup in Seoul, all entrance fees, and a professional tour guide. Full-Day Nami Island and Petite France Tour: Another full-day tour taking in the natural beauty of Nami Island along with ever-popular Petite France, a small village modelled upon colourful classic French architecture. The easiest and quickest way to get to Gapyeong from Seoul is with the ITX (high-speed train). The ITX departs from Yongsan Station regularly and costs ₩6,000. The journey to Gapyeong is just 58 minutes. Much like Suwon, Yongin fails to get much exposure outside of Korea thanks to its close proximity to Seoul. But this city of almost million is no stranger among Seoulite day-trippers in the know who flock here for a handful of famous tourist attractions. With the closest Disneyland miles away in Shanghai and Tokyo, South Koreans flood into their own homegrown amusement park in Yongin, Everland Resort. This family-friendly theme park, the largest of its kind in Korea, features everything from roller coasters to a petting zoo to European-styled architecture. 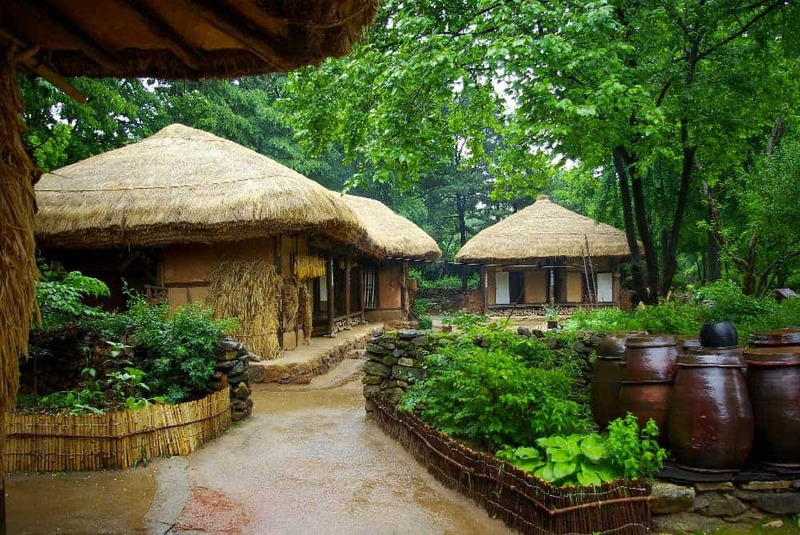 If you’re not travelling with kids, however, Yongin’s Korean Folk Village might be a slightly more attractive choice. Spreading over 240-acres, the Korean Folk Village steps back in time with an entire town comprised of hundreds of recreated traditional Korean buildings. The history lessons go even further with the “villagers” performing traditional musical and martial arts routines, and holding workshops. 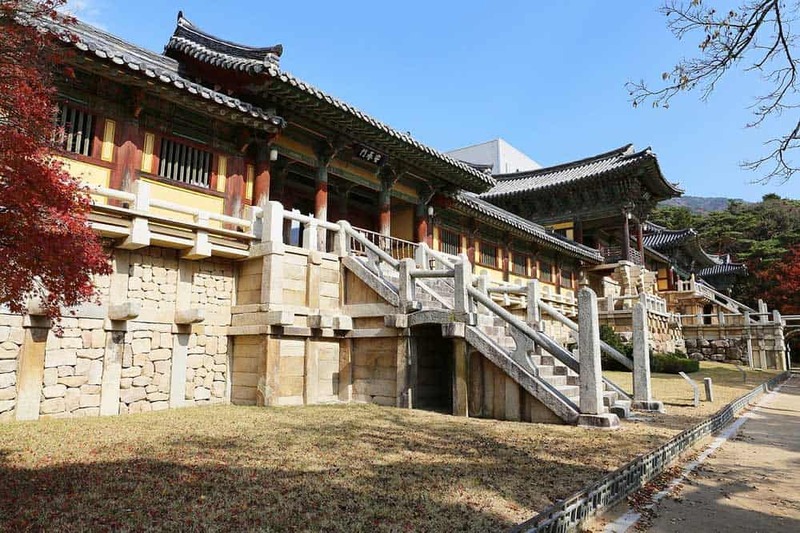 MBC DaeJangGeum Park Full Day Tour: Got Korean history on the brain? Join in this action-packed tour rolling through a day of traditional Korean architecture. Starts with the MBC Drama TV set before continuing on to Yongin’s Korean Folk Village and Hwaseong Fortress in Suwon. Includes lunch and hotel pick-up/drop-off. Everland Theme Park Tour with Guide: Scream on rollercoasters and walk alongside wildlife at one of the world’s biggest theme parks on this family-friendly full-day tour. Includes round-trip transportation from Seoul & an entrance ticket to Everland. Yongin Zipline and Everland Day Tour: Thrill-seekers will never get enough of this adrenaline-pumping day tour including a two-hour zipling excursion and an afternoon at Everland, Korea’s largest amusement park. The Seoul metro now connects into Yongin making the city easy to access. For Everland, take the Everline, a short railway connecting the Bundang Line, to Jeondae-Everland Station. From the station, there’s a free shuttle bus to the park. 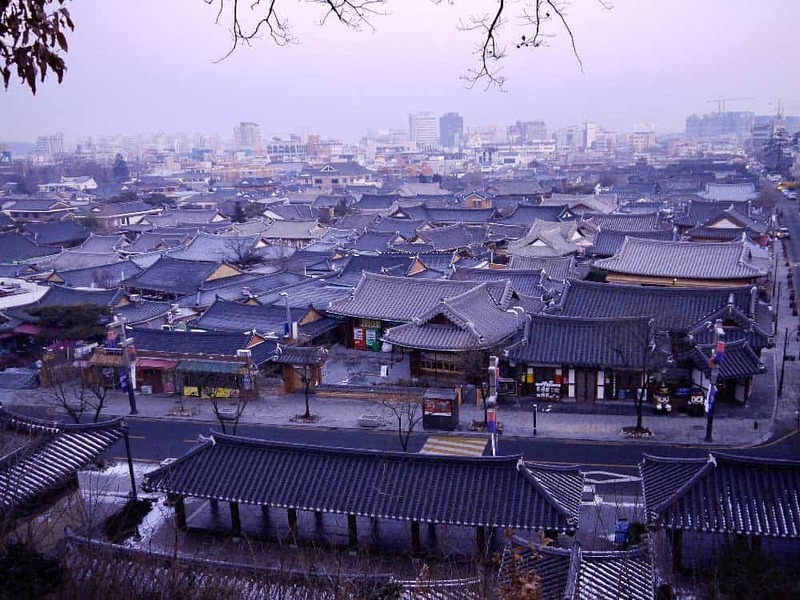 To get to Korean Folk Village, take the train (subway, Korail or KTX) to Suwon Station. At Exit 5, hop onto Bus 10-5 or 37 and exit at the Korean Folk Village. With the advent of Korea’s awesome KTX, the list of places to visit from Seoul is ever-growing. Case in point: Jeonju, a city that, thanks to high-speed rail, lies closer to the capital than ever before. If tasting the sweet and spicy tang of all the best Korean food has become a hobby, I’d bet you’re a budding connoisseur of bibimbap, the country’s most famous rice dish originating in this small provincial city. Among the best things to do in Jeonju is, of course, to sample this gastronomical goodness first-hand—along with all the other culinary surprises the city has to offer. Besides eating, no Jeonju day trip is complete without visiting the Jeonju Hanok Village. Like Seoul’s own Bukchon Hanok Village, this neighbourhood features over 800 hanok (traditional Korean homes) spread over several city blocks. Tucked away among the handsome buildings, food stalls and small restaurants serve some of Jeonju’s best cuisine including its famous bibimbap. Cultural Day Trip to Jeonju Hanok Village and Gyeonggijeon: A full-day tour taking in the main sights of Jeonju including wandering around the hanok area, and a trip to Gyeonggijeon Shrine and its atmospheric bamboo forest. Includes hotel pick-up and drop-off. Jeonju Day Trip from Seoul: Let experts handle all the logistics on this complete full-day tour of Jeonju. Highlights include Jeonju Hanok Village, Jeondong Catholic Church, Gyeonggijeon Shrine, the Hanji Museum, and a delicious Jeonju bibimbap lunch. Jeonju Hanok Village Round-Trip: A budget-friendly round-trip transportation alternative to get to Jeonju without hassle. Perfect option for travellers who prefer less scheduled & relaxed timeframes. Unless you want to waste most of the day on two 3.5-hour one-way bus trips, the high-speed KTX is the way to go. KTX trains leave for Jeonju from Seoul Station (or Yongsan Station for more frequent departures). The shortest journey from either takes less than two hours and costs ₩34,400-₩34,600. Among the best places to visit in Korea, Gyeongju might just be the most classically rewarding of all these day trips. Whether fawning over ancient temples set to a mountainous backdrop or marveling rolling green royal tombs, culture lovers will find plenty to smile about among the historical sites of this old Silla capital. When you’ve only got one day in Gyeongju, beeline for Bulguksa Temple, one of Korea’s most important cultural attractions. Visiting Bulguksa Temple is undoubtedly the highlight of any day trip to Gyeongju, delighting with its ancient architecture brushed onto a background of lush forests and craggy peaks. While exploring Bukguksa, don’t miss out on a chance to check out Seokguram Grotto, the temple’s partner-in-crime on the UNESCO World Heritage list. Perched high above the main temple on Mount Toham, this national treasure features a 3.5-metre-high Buddha nestled inside an expansive granite rotunda. Day Trip to Gyeongju Silla Kingdom UNESCO Sites: Explore the ancient Silla capital on this complete full-day tour covering all the major sites including Bulguksa Temple, Seokguram Grotto, Gyeongju National Museum, Gyeongju Dongung Palace, and Tumuli Park. All entrance fees & hotel pick-up/drop-off in Seoul are included. Korail Day Trip to Gyeongju: Zoom over to Gyeongju aboard the high-speed KTX where a tour guide will meet you to show you the ropes of this fascinating historical city. Highlights of the trip include Bulguksa Temple, Gyeongju Historic Area, and Cheomseongdae Observatory. Gyeongju Historic and Autumn Leaves Day Tour: Buckle up and head over to Gyeongju for a super value-laden full-day tour focused on all the top historical sites including Donggung Palace, Wolji Pond, and Bulguksa Temple with a special visit to Gyochon Hanok Village. Visit in autumn for extra special views! Thanks to the brilliant KTX, one of the best day trips from Busan is now easily accessible from Seoul. On the high-speed KTX, the journey between Seoul Station and Singyeongju Station takes just two hours. Tickets cost ₩49,300 each way, making Gyeongju an excellent candidate for flexing your Korail Pass. From Singyeongju Station, Bus 700 will zip you over to Bulguksa Temple. If you’re dead set on taking on some of these day trips, you’re not going to want to waste time commuting within the city. Since you’ll likely be travelling by train, you’ll want to stick close to a main transport hub like Seoul Station or Yongsan Station. Hotel Manu Seoul: A modern 3-star hotel showcasing impeccable design inside and out. The location just a 10-minute walk from Seoul Station gives the Hotel Manu a big thumbs up as does the relaxing rooftop garden. Four Points by Sheraton Namsan: Linked directly to Seoul Station via an underpass, this delightful modern hotel is about as good as it gets for day-trippers. Rooms are spacious by Asian standards and feature superb city and landmark views. Millennium Seoul Hilton: One of the best luxury hotels in Seoul that grabs your attention from the moment you slip through the doors. Incredible city & mountain views await in the spacious and luxurious modern rooms. The KTX Station lies just 5 minutes away by foot. Built up an appetite? The culinary brilliance of Jeonju beckons! This smaller provincial city, whose claim to fame bibimbap is one of the nation’s most famous dishes, is the perfect place to eat a day away. Find some of its best traditional Korean restaurants and food stalls in the beautiful Jeonju Hanok Village. Need to escape the bustle of the city? Grab your hiking shoes and hop on over to Bukhansan National Park, just a short trip outside of the city. Although you’re unlikely to be able to enjoy this immensely popular outing without company, breathing in the fresh mountain air is an awesome way to recharge from the chaos of Seoul. Got a a hankering for culture and architecture? Visiting Gyeongju is one of Korea’s most rewarding experiences. Fitting in everything in just one day can be tough, but when you’re tight on time on your Korea trip, this is one Korean city that no culture lover should miss out on.